How’s your audio equipment quality? Awesome. Sound quality? Not so much. Acoustic Frontiers has the tools and treatment expertise to solve your room acoustic issues and optimize your audio performance. When considering how to treat their room, most enthusiasts start with online articles and free advice from acoustic treatment manufacturers. What do they get? Generic schemes based on a few photos of their room and some general guidelines. What do they miss? Any kind of precision measurement, computer modeling, or scientific analysis of their room’s specific issues. Almost invariably, these enthusiasts will be palmed off with some variant of this approach: “Add absorbers at first reflection points and bass traps in the corners”. Overemphasis on acoustic treatment, and resulting failure to make simple positional changes to improve bass. Unresolved bass issues, due to lack of measurements and inexperience with effective optimization techniques. Money and time wasted on the wrong acoustic treatments. Mr. Sudario, Los Angeles, CA. For best results you must model your room AND your speakers, understand how they interact, and use those measurements to design the acoustic treatment scheme. Our Acoustic Room Treatment service is one of the most sophisticated in the industry. 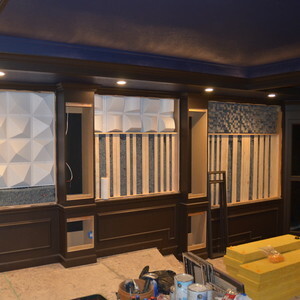 We use commercially manufactured products as well as custom-designed acoustic treatments. And our designs take into account many elements: bass resonances, speaker boundary interference cancellations, early reflections, and late reflections. In existing rooms, we measure bass resonances. In new rooms, we model bass resonances using sophisticated boundary element modeling (BEM) techniques, not just simple room mode calculators. Acoustic treatment is effective at dealing with 100-300Hz issues but becomes less effective below 100Hz. We recommend our Low Frequency Optimization service to deal with these low bass issues. Early reflections created by sound bouncing off the major boundaries in the room–side walls, ceiling, floor, front and back walls—can severely impact sound quality. Our approach is to use our in-house ray tracing tools, alongside acoustic measurements in existing rooms, to reveal the level and direction of each reflection. 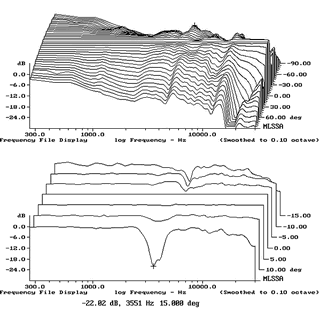 We supplement this with analysis of speaker off-axis response measurements that reveal the spectral relationship of the reflected and direct sounds. From there we assign psychoacoustic significance to each reflection and determine whether to treat through absorption, diffusion, or a hybrid approach, or perhaps to simply leave it untreated and reflective. Late reflections consist of a multitude of low-level reflections, and are often referred to as reverberant sound. 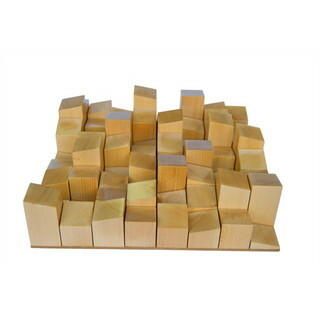 This sound is important for our perception of spaciousness, envelopment, and overall tonal balance. We use measurements and modeling to ensure consistency in the spectral balance of the late reflected field. The Savoy, AVS Home Theater of The Month July 2014! 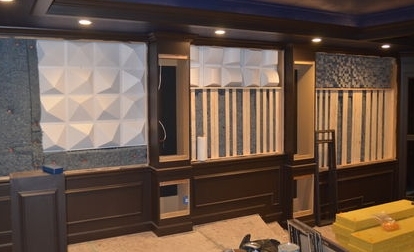 This blog article provides a case study into the acoustic design of David Beck's Savoy Theater, a large dedicated home theater in Iowa that was AVS Home Theater of The Month in June 2014. David came to us wanting help with the acoustic design of his home theater. He specifically requested that the majority of the acoustic treatments be 'DIY-able' to save cost. New acoustic treatment options from Vicoustic!